As an art lover, nothing gets me more more excited than discovering a new artist and being able to buy their original art to hang at home. But that isn’t so easy. If ( like me) you don’t vigilantly follow the local art scene, or have much time to go to smaller galleries to sift through new arrivals, how to find fabulous works by Canadian artists – that you can actually afford? Thanks to ArtBomb, it’s actually a lot easier than you might think. For nearly two years, ArtBomb has been THE link between thousands of potential buyers and local star artists across Canada. The subscriber-based daily online auction features artwork by both established Canadian artists and up-and-comers, which means there’s a pretty good chance something will come up to suit your taste, allowing you to buy what you love. Each piece has been carefully selected by professional curators in Toronto, Vancouver, Montreal, East Coast and Calgary. And with prices ranging anywhere from $200 to $3,000 the website has made the idea of an art auction easily accessible to everyone, rather than just to those who are in-the-know. Subscription is free and I’ve been on the list for over a year now. Every morning, I get an email blast featuring up to three pieces. It can be a painting, print, photograph, sculpture, drawing or mixed media and there is always information about the artist too. An opening bid is set and I’ve got till 11 p.m. to bid on a piece that catches my eye. Artworks are totally unique each day, so if you miss your chance, it won’t come up again. If you do buy a piece, it will come delivered to your home, ready to hang. Recently, I became the proud owner of a dreamy, ghost-like black and white photograph by Shane Fester – which was purchased from the site. 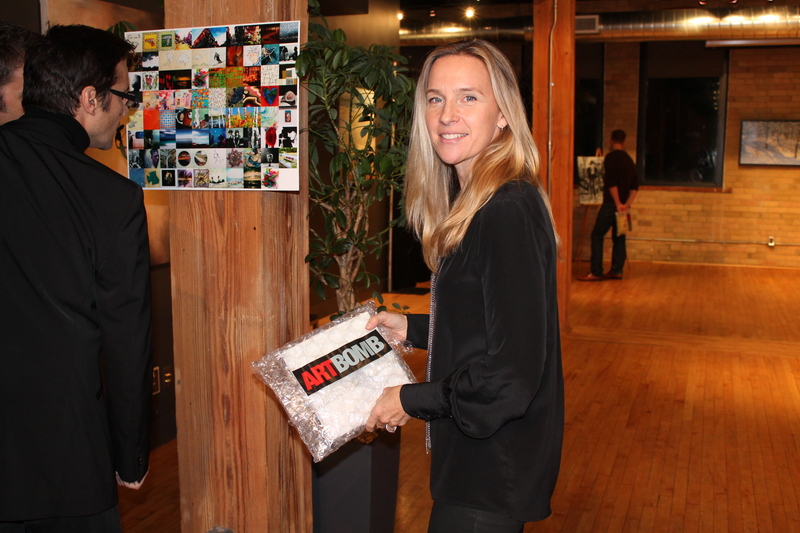 Last week, I attended an event where ArtBomb took an art auction to a whole new level. 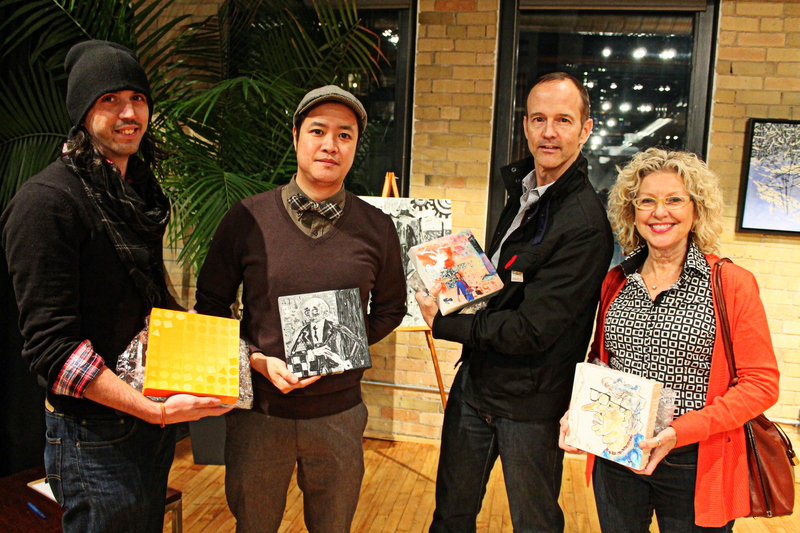 In a fun twist, this online auction held a real live auction and art marketplace at The Spoke Club in Toronto. Art Marketplace was an event where art met strategy. It was part speed-dating and Secret Santa rolled into one! 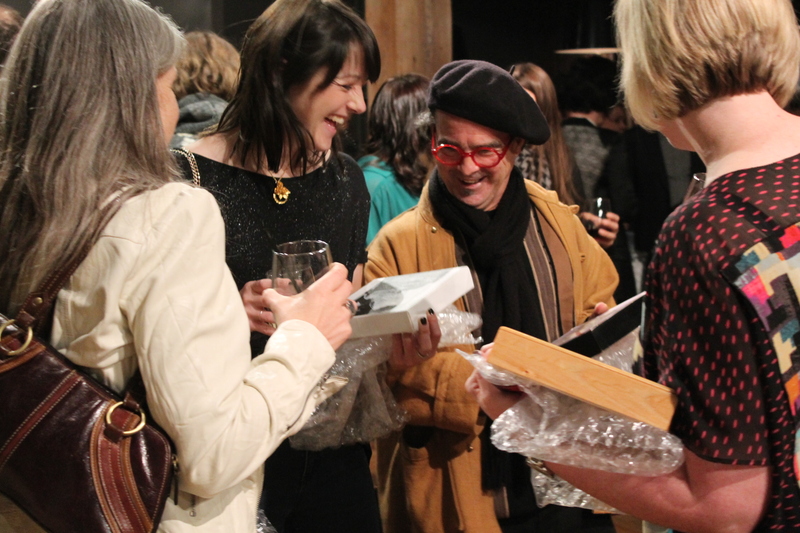 After arriving at the Spoke Club, attendees were given one of 75 carefully curated works produced especially for the evening. The artworks were little canvases and you had no idea what you would get – or if you’d even like it! If you didn’t, you had a chance to trade it with other party-goers. It wasn’t long before the place became very lively as people started to trade, exchange and barter their way to the works they coveted most. 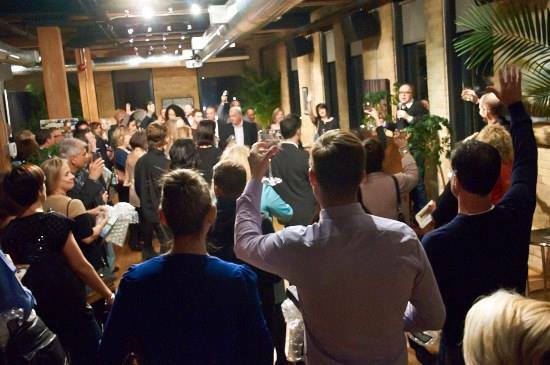 At the end of the night, renowned Canadian auctioneer Stephen Ranger auctioned off any art works that the party-goer hoped to sell. The auction was lively, competitive and a real blast. It was an interesting experience also to see what fellow-art lovers and ArtBomb subscribers were like. They ranged in age from young professionals to seniors, from men in sharp suits to hipsters and trendy women. Further proof that art, truly is, universal. sound like a lot of fun!! !